How did Mike Gottfredson’s annual performance review turn out? 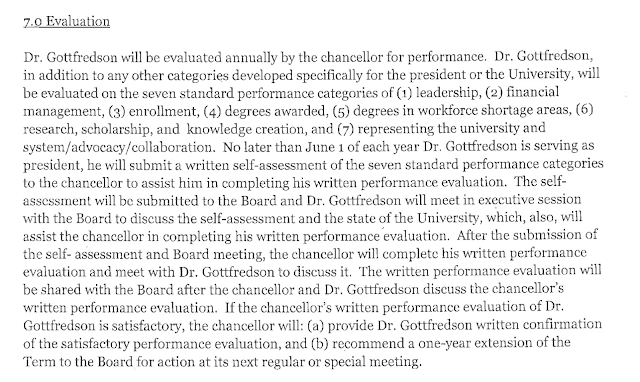 Last year Gottfredson refused to release any details about his evaluation. At the March meeting this year the UO Trustees discussed how they would take over this responsibility from OUS. Anyone hear of any followup? At many universities these evaluations are public as a matter of course. The first year evaluation for President Eli Capilouto at the University of Kentucky is a good example. 44 page report here. Speaking of Kentucky, the interim President of Kentucky State just told his board he wanted a $90,000 pay cut, to fund raises for his university’s lowest paid staff. Story here. 3 Responses to How did Mike Gottfredson’s annual performance review turn out? We got a couple of emails a few minutes back, I think they contain the answer to your query. I guess we know now … didn’t go so well!